We believe food should be delicious and nutritious, and that when organically grown, it's better for both you and the environment. Our organic foods contain no preservatives or additives, and are grown without synthetic pesticides, herbicide or fungicides which agribusiness typically sprays onto food. These chemicals then find their way into the soil, water, air and eventually our bodies. Nothing can replace the richness and complexity of nutrients found in a varied diet of fresh, organic whole foods, and nature’s path organic snacks and breakfast foods are a great way to get started down the organic path. Nature's path organic toaster pastries. A delicious snack. eat them straight from the package or warmed in the toaster, just eat them. they're easy to carry and fun to eat as a lunch snack, after school, or anytime you get the munchies. Packed with the wholesome goodness of USDA certified organic ingredients the whole wheat content and real organic fruit fillings make nature's path organic toaster pastries a healthier choice- any age, anytime, anywhere. Just eat them. 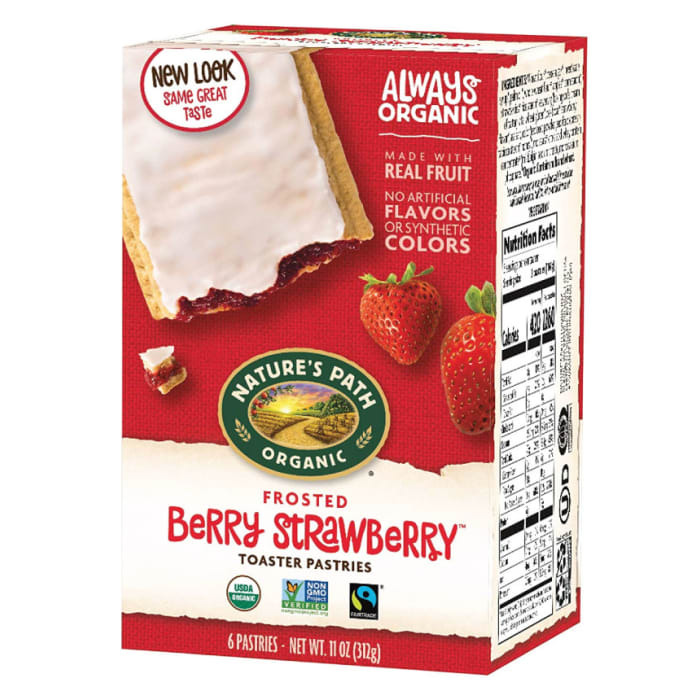 Storage: nature's path organic toaster pastries stay fresh right on the kitchen shelf. This product does not require refrigeration. Best when used before date on end panel, a product of the Canada.